Another amazing peanut butter and chocolate combination for you today! I decided to redo the classic peanut butter cup in a more sophisticated fashion by piping peanut butter mousse into homemade chocolate cups. I’m not sure what it is, but there’s something inherently elegant about mousse, even though it’s really just glorified whipped cream. So at our “cocktail-attire recommended” housewarming party, these made the perfect sophisticated treats alongside my champagne-sorbet floats. The hardest part about this dessert is definitely making the chocolate cups — they require quite a bit of time and patience. Time was on my side (I had the afternoon off) but I almost ran out of patience. The method I chose was painting melted chocolate onto the insides of paper mini-cupcake liners. I actually wound up doing 2 coats for these so they were a little sturdier when I went to peel off the paper. Inevitably I broke quite a few in the process, so I suggest making a few more than you plan on using to be safe. The fact that the paper does peel off easily (regardless of whether or not the chocolate falls apart subsequently) is pretty unbelievable, and it was just as exciting of a process as when I used mint leaves for the cupcake wreath I made back in December. 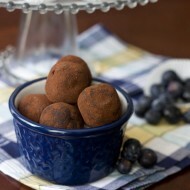 Chocolate is truly an amazing substance, for more than one reason! Once the cups are made the rest is a breeze — whip up some cream, fold in melted peanut butter cups, and you’ve got yourself a fancy and delicious filling. To fill the cups, I put the mousse into a piping bag and used a large round tip to neatly fill each cup. 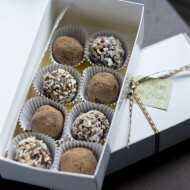 I also used a vegetable peeler and a bar of dark chocolate to garnish the cups with chocolate shavings. – In a double boiler, melt 1 bag of candy melts until smooth. 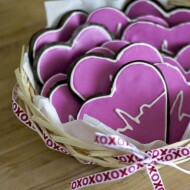 Using a paintbrush, apply a thick coat of chocolate to the inside of the cupcake liners and set aside on a cookie tray. Place tray in the freezer to harden, about 15 minutes. 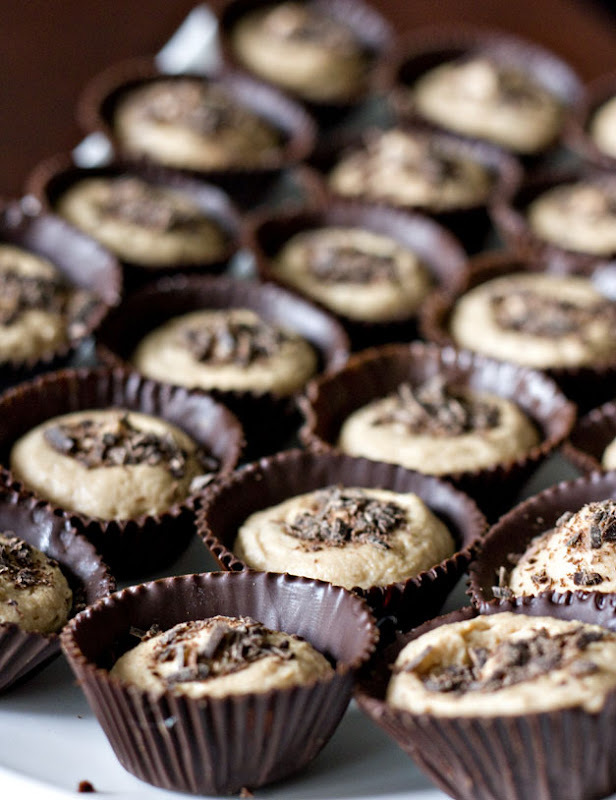 I really can’t provide an accurate number for how many peanut butter mousse cups this recipe makes. I think I wound up with about 36 in the end, with lots of extra mousse. I would recommend buying the 2 bags of chocolate melts and see how many cups you can successfully make, and if for some reason you don’t do so well, just half the mousse recipe. or make the whole mousse recipe like I did and find another way to use it, i.e. eat it with a spoon out of the bowl. I’ve got to try making these. I always love the taste of the first mini Reese’s cup but by the 5th or 6th I start feeling a little queasy. Probably corn syrup overload. 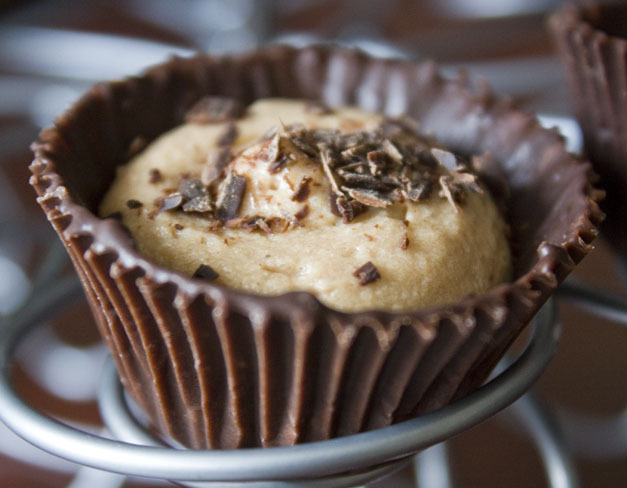 A peanut butter cup made with decent ingredients will probably be a revelation! I love this idea of making your own chocolate cups and my mind is going crazy thinking of all the ideas of different things I could use them for!!! :D Thanks so much for sharing! these look incredible! so impressive and perfect for entertaining! 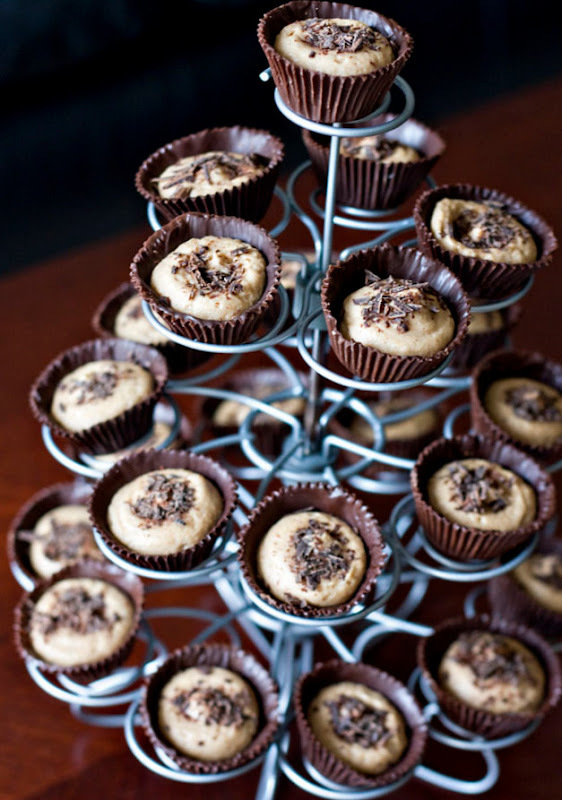 these look like little cups of peanut butter heaven! fantastic! I will definitely be trying these out as I’m addicted to Reese’s (even though I am unable to find them over here — boooo). Those cups look like quite a bit of effort though! Oh my goodness! These look absolutely heavenly!! This is a must try for me. Love the chocolate cups! Has anyone tried making these yet? I’d love to know how an amateur’s results turned out. I really want to try them, but I’m afraid I’ll bust the heck out of them and have to eat more chocolate than I already do. You’re brilliant, Erica! love this idea, thanks for sharing, I’ll be making this real soon for my upcoming guests. These look fantastic! i can’t wait to try this out! Hi Erica, I work with Alaina’s mother and she sent me your link. Check out this site I found for some awesome cupcake “accessories”. Very cool. Like you I have done the chocolate painting of cupcake liners and yes, it’s terribly time intensive and fair amount of breakage. Suggestion: Wilton makes these fluted oval shaped molds to make chocolate cups. So much easier! Had some trouble w/ the milk chocolate, & for whatever reason, the white chocolate just worked out better…easier to unmold. Thanks for a great blog! 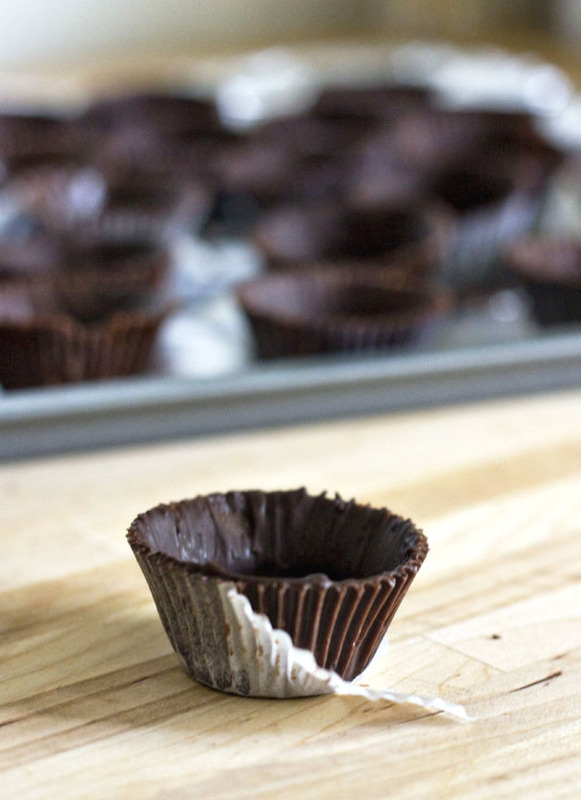 Another way to make the chocolate cups is to fill the foil cup (or whatever you’re using) with chocolate, wait a few minutes until it starts to harden at the edges, then pour the excess chocolate back into the bowl. Much quicker than painting the chocolate in. The longer you let them sit, the thicker the outside will be. I usually leave them in the cups so they are easier to move around and don’t get melty fingerprints on them (don’t ask me how I know lol). Can’t wait to try with your filling. My husband is a peanut butter fanatic! Can u freeze the cups with the mousse in them? If not how long do u think they will stay fresh? I made the cups today, haven’t done the mousse yet. Hey Bev, sorry I’m not sure how the whole thing will hold up in the freezer, but I’m thinking it would be okay. Let me know if you give it a try, I’ve never frozen them before! Decided not to freeze them. I made the cups & just put them in the refrig. I am going to make the mousse today. Don’t need the cookie until Sunday. Thanks for getting back to me.